In the first part of our story, we considered the domestication of Vitis vinifera and the earliest beginnings of wine in the Neolithic period. By the 14th century BCE, numerous societies in which wine held a place of privilege populated the Middle East and eastern Mediterranean. In this chapter, our focus shifts westward. Greeks and Phoenicians, the intrepid seagoing successors of the Canaanites, extend the culture of wine throughout the Mediterranean. Then, under Roman rule, wine takes hold in Europe and becomes, for the first time, a popular mass beverage. Early peoples in disparate locations, we noted in Part I, were drawn to fermented beverages. At Dikili Tash in Macedonia, on the plain of Drama in northern Greece, wine was adopted contemporaneously with other Neolithic communities. The evidence, dating from about 4300 BCE, includes remains of Vitis vinifera grapes fermenting in a clay jar. This is the earliest indication of winemaking in Europe or the Aegean to date. Canaanites sailed from the Levant to Mediterranean islands, Crete among them, before the Phoenicians. Patrick McGovern, the peripatetic wine archaeologist, reported that jars he analyzed at Myrtos, on Crete's southern coast, once contained a resinated wine dating from the late 3rd millennium BCE. McGovern contends it is the very earliest Greek retsina. 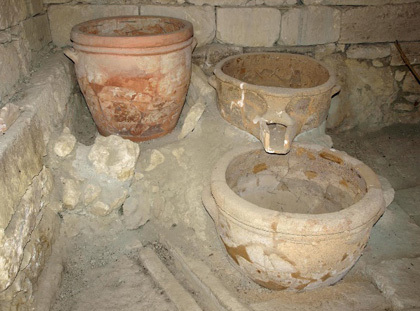 A wine press from c. 1550 BCE has also been found at Vathypetro, a Minoan villa (Fig. 1). Figure 1. Bronze Age wine press at Vathypetro, Crete which dates from c. 1550 BCE. Grapes would have been trodden by foot, the juice flowing from one container to another (Photo www.minoancrete.com). The Mycenaean culture (late 2nd millennium BCE) of Greece, according to Divine Vintage, interacted with Phoenicia, Israel and Egypt. Wine appreciation reached new heights in Greece. The Greeks perfected a social gathering they called a symposium. We understand this as an academic conference, but the original meaning, Hugh Johnson explains, is simply "drinking together." Greeks usually drank their wine diluted with seawater, a beverage they called oinos thalassikos. The authors of Divine Vintage say the Greeks thought "drinking undiluted wine barbarous," typically cutting their wine with water in a 4:1 ratio. This custom spread to biblical lands and west, to their colonies in Italy, in the Hellenistic period. 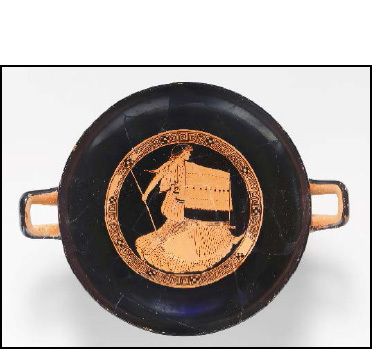 The Greeks crafted a remarkable variety of beautifully decorated mixing, serving and drinking vessels (Fig. 2 & 3). They even seem to have enjoyed mature "eleven year old" wine, as Homer observed. Figure 2. Greek calyx-krater or mixing bowl from Apulia, 400-390 BCE (Fletcher Fund, 1924). Figure 3. Greek kylix or drinking cup, c. 480-470 BCE (Purchase, 1896). Greek city-states as well as Aegean islands developed their own styles of amphorae. The Aegean isles were, Hugh Johnson reports, the principal exporters, led by Chios, which also seems to have made one of the best wines. 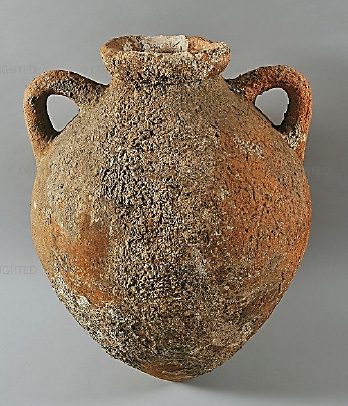 Its reputation was far-reaching: Chian wine jars (Fig. 4), with sharply tapered bodies, have been discovered in Upper Egypt as well as Marseilles, Tuscany, Bulgaria and Russia. Hippocrates, from the island of Kos, is credited as the founder of medicine. "Wine played a part in almost every one of his recorded remedies," Johnson observes. Perhaps not surprisingly, the wine of Kos was sought out for its medicinal properties, notes historian E.L. Will. Such was its value, she says, that Koan wine was counterfeited in Pompeii and sold in amphorae replicating those of Kos - a fitting reminder of that enduring Latin warning, caveat emptor. Figure 4. An amphora missing one handle from the island of Chios, 350-330 BCE (Photo Woods Hole Oceanographic Institute, www.whoi.edu). Greeks and Phoenicians established settlements throughout the Mediterranean in the Homeric period, bringing a wine culture wherever they went. Greeks colonized southern portions of the Italian boot in the 8th century BCE, naming it Oenotria, land of wine. Today, we can still see their influence in the alberello or "small-tree" vine training system of Puglia. Phocaean Greeks from Lydia in Anatolia settled in Corsica and elsewhere along the northern Mediterranean, bringing vines. They founded Massalia, present-day Marseilles, around 600 BCE. Phoenicians introduced viniculture to Motya, off the western coast of Sicily, an area which would become famous for Marsala wine. Their contributions have been confirmed by shipwrecks containing amphorae and the remains of grapevines planted in soil. They established the once-vibrant city of Carthage in today's Tunisia where, notes Patrick McGovern, "wine was the beverage of choice." Phoenicians left their mark as well in Sardinia, at Cádiz in Spain and, sailing out into the Atlantic, even Portugal. Among the peoples influenced by Phoenicians were the Etruscans, who inhabited Tuscany and parts of north central Italy from the 8th to 3rd century BCE. Etruscans fashioned transport amphorae with ear-like handles (Fig. 5). They exported their own wines - precursors of contemporary Tuscan bottlings - to Gaul (France) by the 7th century BCE. There are traces of their presumed role as consulting winemakers including the oldest wine press yet found in France, dating from 425 - 400 BCE, uncovered in the city of Lattes near Montpellier on the Mediterranean coast. Figure 5. Etruscan transport amphora for wine, late 6th - early 5th century BCE, replaced in 4th century BCE by Greco-Italic models fabricated in southern Italy and Sicily (Photo © Museo Galileo, Florence, Italy). Roman civilization was influenced by the Etruscans and many others with a penchant for wine. During Rome's reign, wine became a democratic beverage for the first time. As Alexander Conison writes, wine was "a feature of every social stratum" by the early Empire. Conison estimates that total consumption of the city of Rome, with one million residents by the 1st century BCE, was around 1.5 million hectoliters (16.7 million of today's 9-liter cases of 12 bottles). Various historians believe annual per capita consumption of capital dwellers to have been 150 to 200 liters, an extraordinarily high level that dwarfs the 33 liters per inhabitant of Italy in the 21st century. Pompeii (Fig. 6 & 7) provides a striking illustration of Roman drinking habits: the town boasted roughly one tavern or thermopolium serving food and drink for every 100 people, according to Conison. He could not find any modern city with a density of drinking establishments remotely close to Pompeii. Figure 6. 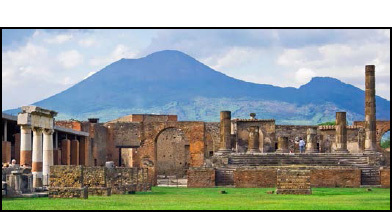 Pompeii, Arch of Tiberius, with Mount Vesuvius in background (Photo Franceso Lastrucci, www.smithsonianmag.com). Figure 7. The marble counter of the tavern or thermopolium of Vetutius Placidus (Photo © St. Louis Patina). Prior to its demise in 79 CE, the town was a major commercial center of the international wine trade and benefited from a large harbor, later silted up. Hugh Johnson suggests Pompeii "foreshadowed what Bordeaux was eventually to be." The principal destination of the wines produced in its vicinity (Campania) was the Roman capital. The eruption of Vesuvius destroyed some of the finest vineyards of the day. To slake the Empire's enormous thirst, grapevines were planted in France and Spain. By the 1st century CE, certain Gallic wines "had attained the prestige of the most renowned" Greek and Italian icons, according to French scholar Roger Dion. For centuries, the amphora remained the indispensable container to ship wine, olive oil, fish sauce or other comestibles. E. L. Will compares Roman cargo ships to oil tankers filled "with hundreds, sometimes thousands" of amphorae. Romans transported goods throughout their vast realm and as far as India: the Empire constituted the largest market for wine until modern times. There were noteworthy advances in viniculture in this era. By the 1st century BCE, more efficient lever-and-screw presses were introduced together with corks to seal amphorae. Carafes and drinking vessels made of blown glass, at first of Syro-Palestinian fabrication, began to appear but remained a luxury (Fig. 8). Figure 8. 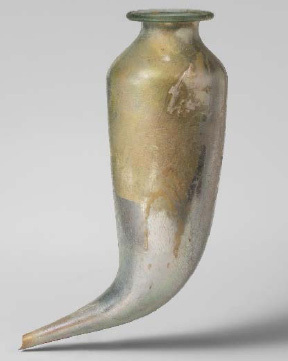 A Roman blown-glass drinking cup or rhyton, mid-1st century CE (Gift of Henry G. Marquand, 1881 © The Metropolitan Museum of Art, www.metmuseum.org). 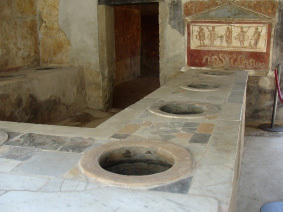 As had been the norm in earlier societies, wine in the Roman period was fermented in a buried earthenware jar or dolium, equivalent to the qvevri of Georgia and pithoi of Greece (Fig. 9). Figure 9. 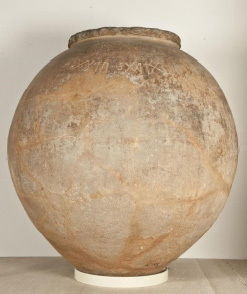 Roman dolium to ferment wine marked with its capacity, about 2,000 liters, larger than was typical, 1st - 3rd century CE (Photo © National Museum of Archaeology, Tarragona, Spain). Lucius Columella of Cádiz in Iberia issued an enlightened agricultural treatise in about 65 CE entitled De Re Rustica. He examined the large slave-reliant estates or villas which dominated wine production. Columella put forward the idea that the quantity of grapes should not be excessive if quality was the aim. He and Pliny, in his Natural History of 77 CE, advanced principles still valid two thousand years later in terms of the exposure of vineyards, density of planting, and drainage. They showed awareness of hygiene and temperature in the cellar, and the particularities of specific sites, a concept the French would come to call terroir; its origin is the Latin word territorium. Certain Roman wines enjoyed what amounted to "cru" status. Johnson and others say that Falernian was an acknowledged "Roman first growth." It was based on the Amineum (or Aminean) vine, which Columella indicates was brought by the Greeks. Pliny writes that it is of the "very highest rank" of 91 varieties he discusses in Natural History. As for the preferences of drinkers, the practice of adding seasonings and diluting wine with water continued. Romans enjoyed strong flavors: wines of high alcohol (15% or 16%, the highest yeasts would achieve) sweetened with honey or boiled, concentrated grape must. Fish sauce (garum) was a common food condiment. Connoisseurs appreciated aged wine - 15- to 20-year old Falernian - as did their counterparts in Greece and Egypt. Finally, the amphora, linchpin of ancient wine, was gradually replaced by the wood barrel, a Celtic innovation, in the first centuries of our era (Fig. 10). Figure 10. The first known depiction of wine barrels, on a barge on the River Durance, tributary of the Rhône in France. The boat is being pulled by two slaves. Amphorae can be seen along the top of the image. Gallo-Roman, c. 1st century CE (Photo en.wikipedia.org. Original bas-relief © Musée Calvet, Avignon, France). In the ancient world, "the vine was the object of a quasi-religious respect," Roger Dion has written. He declares that "from Greeks to Romans to us, a civilization has been transmitted which has made wine one of the most precious gifts of the earth." We have learned that the origins of wine extend far into the past, and that many cultures have played a part. What we know today has been informed and conditioned by all the peoples who preceded us, all the way back to the very earliest Neolithic wine drinkers. Butler, Joel; Heskett, Randall. Divine Vintage: Following the Wine Trail from Genesis to the Modern Age. St. Martin's Press, 2012. Conison, Alexander. The Organization of Rome's Wine Trade. AAWE Working Paper, No. 123, November 2012. Dion, Roger. Histoire de la Vigne et du Vin En France des Origines au XIXe Siècle. Flammarion, 1977. Garnier, N., Valamoti, S.M. Prehistoric wine-making at Dikili Tash (Northern Greece): Integrating residue analysis and archaeobotany, Journal of Archaeological Science, 2016. http://dx.doi.org/10.1016/j.jas.2016.03.003. Johnson, Hugh. Story of Wine. Mitchell Beazley, 1999. McGovern, Patrick E. Uncorking the Past: The Quest for Wine, Beer, and Other Alcoholic Beverages. University of California Press, 2009. Paterson, Jeremy. Rome, classical. Oxford Companion to Wine, 4th edition. Oxford University Press, 2015. Will, Elizabeth Lyding. The Roman Amphora - Learning from Storage Jars. Archaeology Odyssey, January-February 2000.